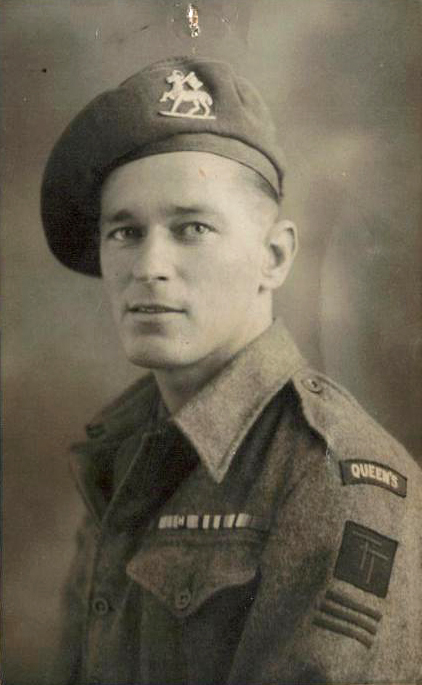 This is a photo of my dad, Tom who was a tank driver with the Queens Regiment during WW2. He was a tank driver and served in Tunis, El Alamein and many other areas before being sent home with malaria and typhoid. I was told that there was an article about him in the Argus on his return, but I have no evidence of this. Unfortunately he died in 1987. Does any one remember him or know any other members of his platoon? If so, I would love to hear from you. Interesting to see the Tyne Tees divisional patch on his arm, shouldn’t it be the 7th armoured ‘Desert Rats’? Colin, I think this may answer your query on the shoulder flash. My Uncle J Battman served with 1st/7th throughout the war as a bren gun carrier driver 1/7th Battalion: When war was declared in September 1939 the 1/7th Bn. was part of 131st Infantry Brigade, 44th (Home Counties) Infantry Division stationed in New Street, Walworth, London. With the rest of the Brigade and Division it arrived in North Africa in mid 1942 and took part in the Battle of Alam Halfa before joining 7th Armoured Division for the battle of El Alamein. During the advance from El Alamein the enemy counter-attacked at Medenine. Here on 7th March 1943 the 1/7th Queen’s put up an epic resistance to the German counter-attack, and succeeded in knocking out 27 German tanks with their 6-pounder anti-tank guns. It the remained with the Division throughout the North African Campaign, in Italy, Normandy and in Northern Europe. During the action at Villers-Bocage (13th June 1944) the battalion used its 6-pounder Anti-Tanks again to good effect, when it went ‘Tiger Hunting’ in the town using these guns and their PIATs to ambush any German tanks they could find. Although 7th Armoured Division was not engaged in Market Garden, 1/7th Queens were involved with Guards Armoured Division in keeping the Nijmegen road open from 24th September 1944. In November 1944 the battalion was disbanded with those of it not returning to the UK under the ‘Python’ and ‘Lilop’ orders joining the 1/5th Battalion to replace the casualties suffered in the Bocage and the break out into France and Belgium. Quite a few others were also transferred to the Kings Shropshire Light Infantry. The cadre of the battalion served out the remainder of the war as part of 151st Brigade, 50th (Northumberland) Division, as a training unit. Many thanks Ash, that’s enlightened me! Hi sadly my father Aurther Preece passed away 8years ago, he was with the 1st 7th queens, was evacuated at Dunkirk then stood guard at Dover castle, then on to Africa. At some time he was put incharge of a an Italian prisoner of war camp.Then it got a bit hazy. All I know is he ended the war on the river Poe in Italy. Can you tell me where I can get any of his war history? Many thanks. Hello Derek. Have you tried contacted the Surrey Infantry museum? Hi Derek, you and, anyone looking for service records -Army, Navy, Marines, or Air Force, need to visit the Ministry of Defence web site and read the following page ‘Requests for personal data and service records’ https://www.gov.uk/requests-for-personal-data-and-service-records scroll down the page until you find the downloadable forms ‘Request for Service personnel details: British Army part 2 (PDF)’ and ‘Request for Service personnel details: next of kin form (v6) (PDF)’ – download both of these acrobat documents onto your computer. I have no idea why the forms is a ‘Part 2’ as there doesn’t appear to a a ‘Part 1’. The address to submit the forms to is on them, along with details of fees and what information you need to supply. Good luck. Hi. My uncle Patrick Toolan MM, was a lieutenant in the 1/7th in Normandy. Unfortunately he was killed as Briquessart on 17th June 1944. He may well have known your dad or vice-versa. He too was in the 8th Armoured Division. He was awarded his military medal in Palestine in 1939. I have photos of him and one being presented to King George in Feb 1944. Hi Martin, Patrick Toolan MM is my grandad’s brother which would make you and my dad cousins? We would really like to hear from you?